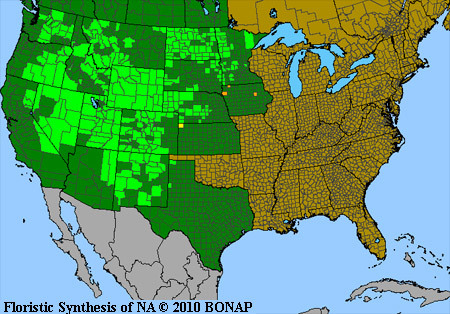 Intermountain Flora indicates that there are about 200 species of Crepis and that we have twelve species native to the New World. The plants are often difficult to identify because they hybridize. 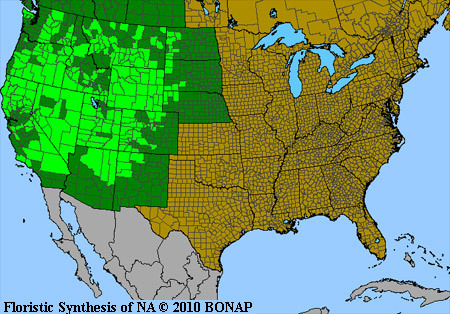 Most of our species, Intermountain Flora indicates, belong to a "complex in which the lines among taxa can only be drawn arbitrarily.... Clear distinction among [most of our] species should not be expected and in fact do not exist." 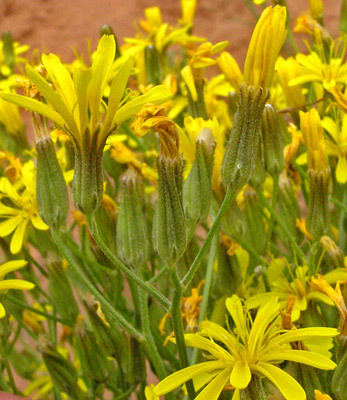 William Weber calls this genus Psilochenia but it is almost universally called Crepis. "Psilochenia" is from the Greek for "bare seed". "Crepis", a boot or sandal, is an ancient Greek name used by Pliny for some plant. Foothills. Openings, woodlands. Late spring, summer. Can-Do Trail above McPhee Reservoir, June 4, 2009. C. xintermedia "can be (often arbitrarily) separated from [C. acuminata.] in the following ways: leaf lobes usually denticulate or lobate (vs. entire); cauline leaves usually pinnately lobed (vs. entire); inner phyllaries more or less villous-tomentulose (vs. only at tip) and with (at least a few) blackish, non-glandular setae [bristle-like hairs] distally on midrib (vs. lacking); and fruits yellow to golden (vs. pale yellowish brown to tan). However, other floras, for example, A Utah Flora, do not agree on the details separating the two species. 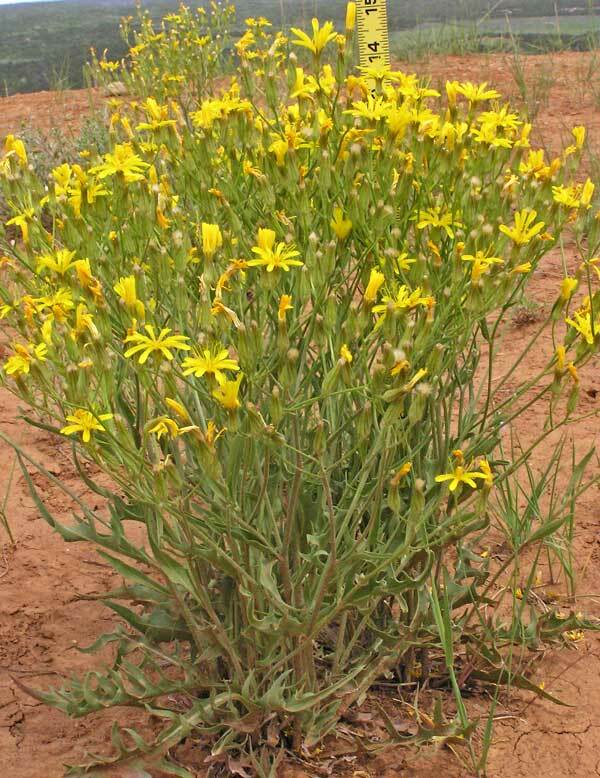 For instance, the key for Crepis in Flora of the Four Corners Region indicates that the basal leaves of C. acuminata and its hybrid, C. xintermedia are pinnate; A Utah Flora says they are pinnatifid (as shown in my photograph below). Crepis intermedia / Crepis acuminata, like its very close cousin, Crepis occidentalis, often grows in clusters, but the former tends to grow in very dense, tall clusters whereas Crepis occidentalis tends be shorter and, although upright, the clusters tend to be spread along the ground over a wider area. Leaves of Crepis intermedia / Crepis acuminata have a very prominent mid-vein and are deeply lobed, sometimes with teeth on the lobes. 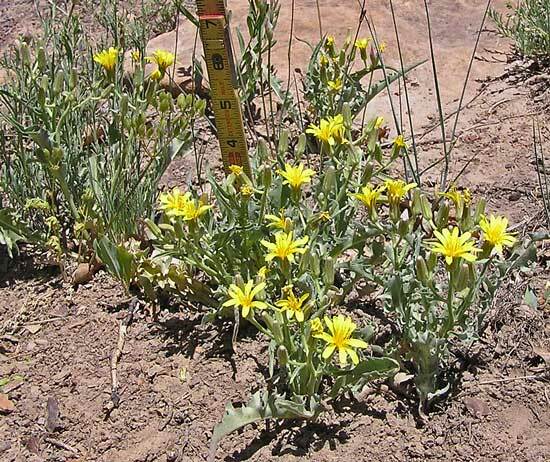 Crepis intermedia / Crepis acuminata is taller than Crepis occidentalis, growing from twelve-to-twenty-four inches tall (Crepis occidentalis grows from about 4-to-15 inches tall). Both plants have an abundance of bright golden/yellow flower heads composed only of ray flowers. Seeds (achenes) of Crepis intermedia are light yellow or brown; those of Crepis occidentalis are usually darker brown. 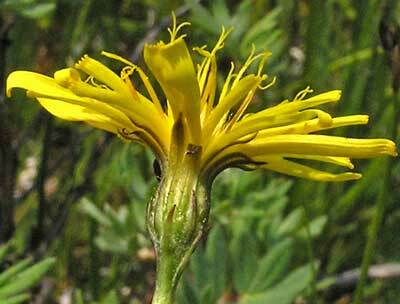 Asa Gray named this plant Crepis intermedia in 1884 from a collection made by Bolander in Yosemite Valley. William Weber renamed it Psilochenia intermedia in 1983. John Kartesz considers Crepis intermedia and Crepis acuminata to be distinct species. Crepis intermedia has 10-60 heads of flowers per plant and each head has 7-16 ray flowers. 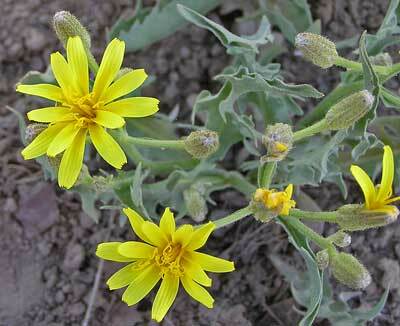 Crepis occidentalis, shown below, has fewer heads of flowers (2-25) but more ray flowers (12-30) in each head. Mona and Mike's Five Spring Farm, May 26, 2016. Foothills. Openings, woodlands. Late spring. Mesa Verde National Park, Prater Ridge Trail, June 5, 2004. Crepis occidentalis often grows in dense, upright clusters, has deeply lobed basal and stem leaves somewhat similar to those of a Dandelion, and has bright golden/yellow flower heads composed only of ray flowers. In dry locations or dry years it grows to about five inches tall; in more favorable conditions it can reach twelve-to-fifteen inches. 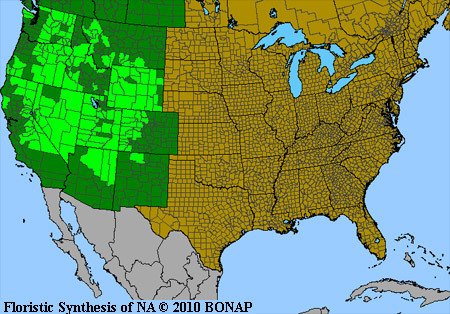 "Occidentalis" is Latin for "Western". 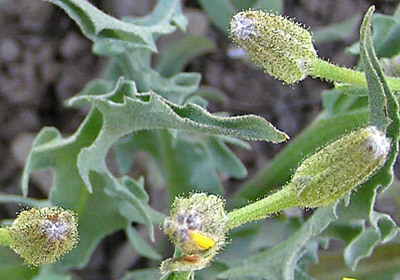 Nathaniel Wyeth collected the first specimens of this plant for his botanist friend, Thomas Nuttall, and Nuttall at first named the plant Crepis occidentalis in 1834. Nuttall renamed the plant Psilochenia occidentalis in 1841. Involucres are covered with minute, vertical, glandular hairs that are enlarged at their tip. Leaves have small hairs and are folded inward and lobed in an irregular manner. Montane, sub-alpine. Wet meadows. Summer. Haviland Lake Trail, June 27, 2005. This slender Crepis would be lost in its normal habitat of grassy meadows except that its bright yellow flowerhead grabs our attention. 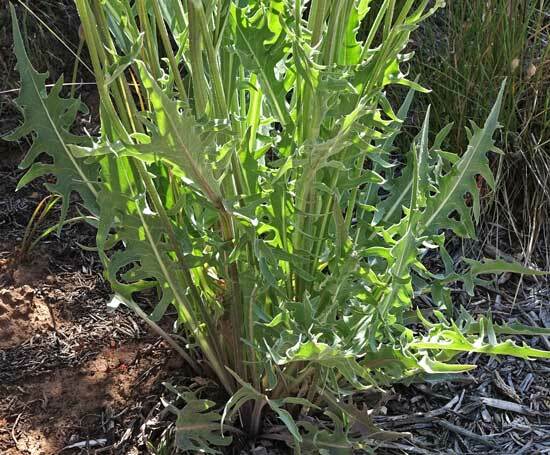 Then we follow down the tall almost leafless stalk to the small Dandelion-like leaves. Notice how smooth the margins of these leaves are compared to the deeply cut and toothed margins of the above pictured Crepis. 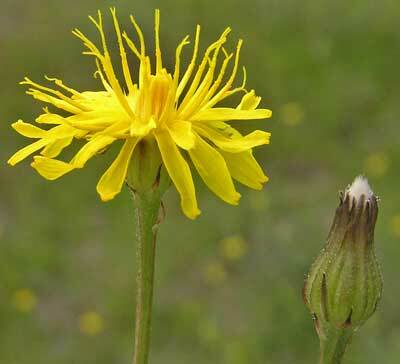 Crepis runcinata grows to 15 inches tall and where you find one growing in a meadow, you will find many others scattered nearby. Edwin James collected the first specimen of this plant for science around 1820 and named it Hieracium runcinatum in 1823. 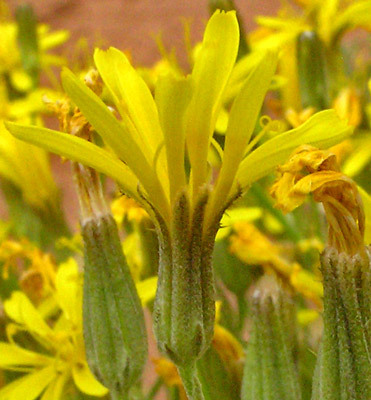 Torrey and Gray renamed it Crepis runcinata in 1843 and it has since undergone a number of name changes, including Psilochenia runcinata assigned by Löve and Löve in 1982. "Runcinatus" means "saw-toothed". Lone Mesa State Park, August 5, 2008. A very fresh flower stands next to a flower that has been fertilized and has dropped its the single petal of each ray flower. The white fluff is the pappus hairs that sit atop the seeds and carry them on the wind after the seed head fully matures. Several key factors help to distinguish this Crepis from the above Crepis: its wet habitat of montane and sub-alpine meadows, its very broad, bulbous involucre, and its lack of hairiness. This Crepis (and the two shown above) has only ray flowers.